I’ve always profoundly believed that the presence of the writer is inevitably contained in the work just as the fingerprints of a burglar, who has forgotten to wear gloves, are left on the windowsill he has just escaped through. The critic or the constable arrives with the dusting powder and Voila! A good thumbprint where he levered up the latch or a middle finger on the glass. The style we write in reflects our character. Her interpretations of the three quotations all point to the idea that the trained personal sensibility of the writer who looks, feels, wonders, accepts or notices and intuits a significance in what he or she sees will be evident in the writing that emerges from the experience, as individual as fingerprints. Smither’s own fingerprints are all over The Commonplace Book. Her distinctive personal sensibility – quick, alert, curious, intellectual, aesthetic – is expressed not only in the style of her comments, but in the quotations she chooses, in the range of subject and feeling and concept that is found in them, in the things she looks at and the way she interprets them, and in the distinctive genre she has invented for the book. That genre is neither the notebook nor the diary nor the traditional commonplace book, but a combination of all of them. She has taken three of her commonplace books, ‘collection(s) of miscellaneous quotations extracts, pensées’, and made a ‘journey’ through them by flicking through and selecting entries that spoke to her at the moment and interspersing ‘suppositions, incidents, memories springing from the entries themselves’. She has made a personal selection from three personal collections and used those items as springboards for a variety of personal responses. Some of those responses are like diary entries, some are poems, some are anecdotal narratives, some are miniature personal essays, some are small pieces of subjective literary criticism. All carry the marks of her sensibility. Readers of the novels The Sea Between Us and Lola, with their sequences about life in fine hotels, will see their basis in Smither’s own taste and experiences; shown in her response to a quotation from Hilary Mantel concerning the desirability of writers when they travel overseas going first-class and staying in ‘the best hotels’ – an agreement on the necessity of ‘short periods of luxury for authors to preserve their equilibrium and sanity. Only the best and most stylish hotel will do’. Her response then segues into accounts of her most pleasant experiences at literary festivals held in hotels in Melbourne and in Spain. Responses to other quotations lead to anecdotes from other recurrent experiences of the social side of literary life at poetry readings and book launches, including her own dislike of filling in the time at a lecture and reading by giving ‘a little of the background’ of the poems she reads, ‘as if each should-be-able-to-stand-on-its-own-feet poem needed a little autobiographical note the way a woman needs a purse’. as if … as if … three times it appears on the same page and two will have to be throttled and their carcasses thrown into a ditch. ‘Kill your darlings’ and it feels like Sophie’s Choice. The very best sentences are guillotined and protest. But there is satisfaction at the end of the process when that ‘something’ that ‘may be stirring . . . somewhere below the surface’ of a novel becomes visible: ‘Later, when all the cutting, rewriting and removal of red clothes is complete, this mystery may be revealed: a strange sense of unknown things joining up, claiming a kinship (and giving your work a structure) you had never expected to find.’ In a response to a quotation from Fra Mauro, cartographer to the court of Venice – ‘What wisdom is acquired during the course of a life is the result of the mind’s tenderness towards the heart’ – she describes the process of editing Lola, weeks with ‘my mind definitely not showing a trace of kindness towards my heart, which was merely required to go on beating’. It took a ‘Marie Curie revival meal’ of ‘a little steak and pommes frites’ with a glass of red wine, followed by a chocolate brownie and a liqueur for her to recover. However, looking back at the experience she can say, ‘now I can admit I enjoyed it, the way a minister of war might enjoy going into a bunker’. When I am mentoring I advise against lines too packed (like suitcases with some of the contents bulging out under the straps). It may be that the poet, through practice, has first to unpack. To sort through images like old clothing, familiar, comfortable, no longer fresh or co-ordinated, but put on almost in the manner of prejudices. Such practical criticism is not reserved for those she is mentoring. One entry opens with a quotation from a letter by Lloyd Jones about how he is ‘trying to overcome the tyranny of narrative and dig down into moments that may or may not be connected or only connected because I have wilfully placed them side by side.’ The letter leads Smither to look at the way Katherine Anne Porter in ‘Pale Horse, Pale Rider’ moves into ‘deeper preoccupations’ than plot and to conclude with a tribute to ‘the marvellous Marilynne Robinson whose Gilead and Home recreate moments of such frustration and tension and grace you feel the whole of human nature is located in a shabby old-fashioned kitchen in a parsonage in Iowa’. Many other themes that also occur in the poetry and fiction appear in The Commonplace Book. In two entries concerning Terry Sturm, Smither bring together some of her own ‘deeper preoccupations’ – friendship, death (often linked with it for one of her generation and mine), literature and its value, imagination. The first, a diary entry for 25 May 2009 early in the book, is her response to receiving the news of his death. She remembers her positive contacts with his human warmth, and pays tribute to his ‘truly fine intellect, founded not in egoism but in care, accuracy, and a great ability to think’ so that he could patiently work to find ‘the nearest we can come to truth’, whether in literary judgement or in human relations. The second, late in the book, is a meditative reading of Wallace Stevens’s ‘Final Soliloquy of the Interior Paramour’: ‘Terry‘s favourite poem, fixed to the fridge’, the poem that had been read at his funeral, a poem ‘inexhaustible, beyond explanation, but not beyond comfort’, that tells us that ‘Existence, with imagination, is enough’. 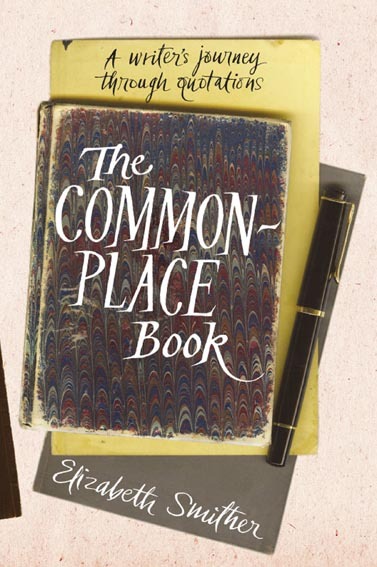 In The Commonplace Book Elizabeth Smither, as she has done in her poems, her short stories and her novels, has found an appropriate vehicle for expressing her unique sensibility. She has left her fingerprints on another kind of fine verbal object. LAWRENCE JONES is Emeritus Professor of English at the University of Otago. He is at present finishing a critical work on the fiction of Maurice Gee and is assembling a collection of his essays of the last twenty years on New Zealand writers.